The Martin CX 10 extreme: Changing so much more than color. The new Martin CX 10 extreme is not just the next color changer in the Martin range - it is an evolution in decorative lighting. Using the boundless combination of color and pattern, the Martin CX 10 extreme layers every environment with the shape and shade of its intended use, pronouncing the message your club, your space, your decor wants to communicate. • Split color function with continuous scroll effect. • Motorized, double sided effect wheel with 13 dual positions to overlap effects. • Total lumens output = 3928 lumens. Featuring a motorized color and effect wheel and mesmerizing morphing effects, the Martin CX 10 extreme lets you redecorate your space from moment to moment with just the right mood and message. The Martin CX 10 extreme is extremely versatile in its application usage. Designed to suit a wide array of environments such as clubs, restaurants, rental and stage, the Martin CX 10 extreme gives you light as an alternative to building materials, setting the mood and promoting individuality. A motorized, double sided effect wheel gives you a total of 13 dual positions and the ability to overlap effects. Each position can be fitted with colors, CTC filters, gobos, textured glass or beam apertures. Unique in such a fixture, the Martin CX 10 extreme uses floodlight effects to disperse light into every corner of the room – no matter what the space. The Martin CX 10 extreme is the big brother of color changes. A powerful 250W discharge lamp and a highly efficient reflector give a forceful beam of light to detail every pattern. 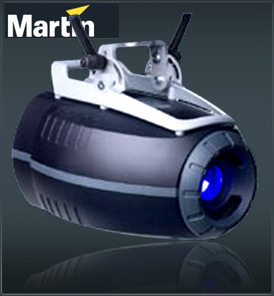 The Martin CX 10 extreme comes with a frost filter to sharpen or soften the projected color, a variable speed strobe and an exceptionally smooth dimmer. In the Martin CX 10 extreme, design starts even before the light hits the lens. Despite its abundance of features, the Martin CX 10 extreme is a compact and elegant fixture that won’t crowd your ceiling. A combination of mechanical and design factors coincide to reduce noise emission to the comfortable levels demanded by theatres and studios. Easy access to lamp and critical components make the CX-10 easy to clean and service. The Color wheel on the Martin CX 10 extreme can be replaced or supplemented with an animation wheel to give naturalistic effects such as flickering flames or rippling water. Color flags can then be transferred to the effect wheel where combined with gobos or textured glass, a brilliant decor effect is given.